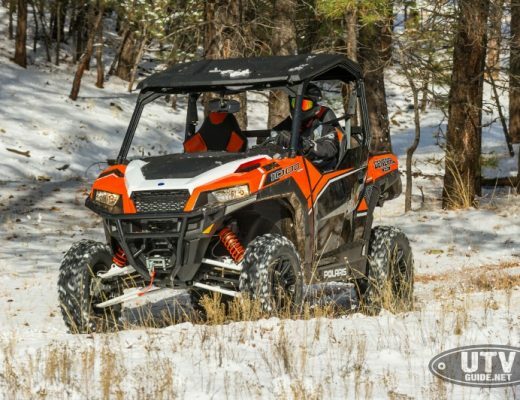 With all the diverse terrain in this world and extensive riding conditions, it almost seems as though there should be a custom tailored UTV to fit each individual need. Well, Polaris Industries has done just that. 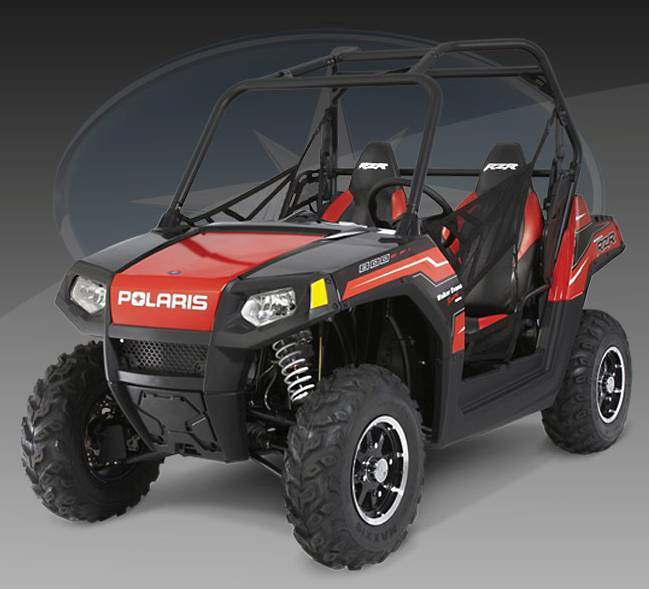 Polaris seems to have a RZR for every rider and the all new 2010 Walker Evans Limited Edition Polaris Ranger RZR fits a niche, and fits it well. Weighing in at 945 lbs and keeping the slim 50 width, this RZR is definitely a gate slipping, dirt ripping trail-machine! Only have access to tight trails, woods, or limited on space? No worries. 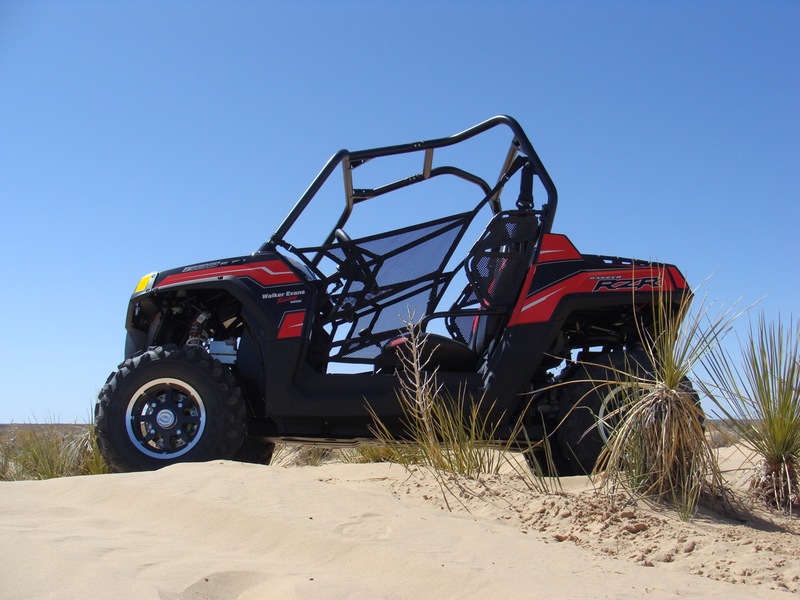 This LE RZR will squeak through those tight pesky ATV trail gates or fill all your special needs and still give you that sporty aftermarket ride. What about power you ask? It has gobs of it and this LE wouldnt be wearing the RZR name if it didnt. Even at 5,000 FT. elevation with hot dry air, it still had great low end torque and a 60 mph top speed to keep you grinning and your passenger white-knuckling the standard and much used grab bar. 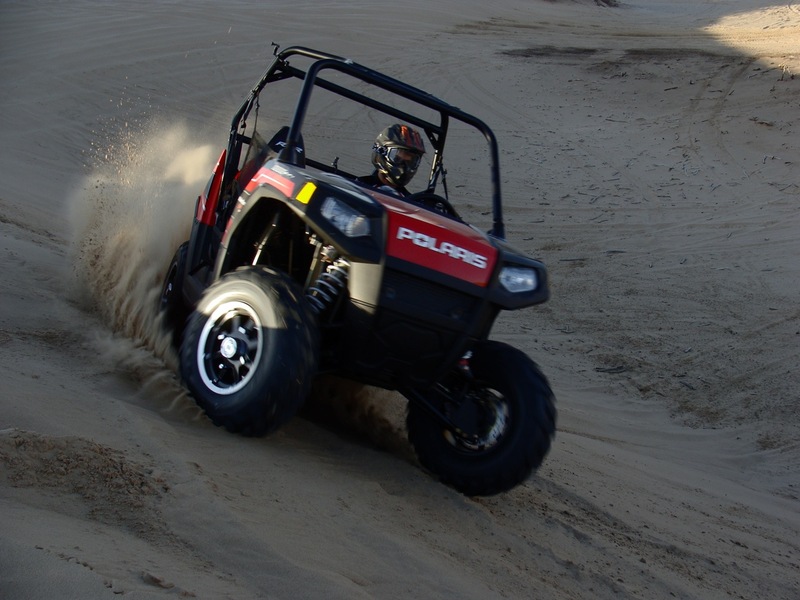 Thanks to the adjustable, remote reservoir, 2 bore Walker Evans Racing Shocks, this UTV feels rock-solid and inspires confidence even at those high speeds. Not only does it feel good out of the box, but these beefy looking shocks also give the rider the ability to dial in the compression and preload and still keep that oh so needed 10 ground clearance. All that with a factory warranty, a killer looking graphics package and the performance to boot! On this outing I was accompanied by several fellow RZR owners that all agreed, the custom Walker Evans Racing graphics package looks sharp. The colors are vibrant and the contrast between the black and the Indy Red just makes it pop. Not only do you get cool graphics, but it also comes with custom cut and sew stitched black and Indy Red deluxe seats, along with 12? black Crusher rims. A win win! The graphics also have a touch of white that ties in nicely to the Bright White painted front and rear suspension springs. 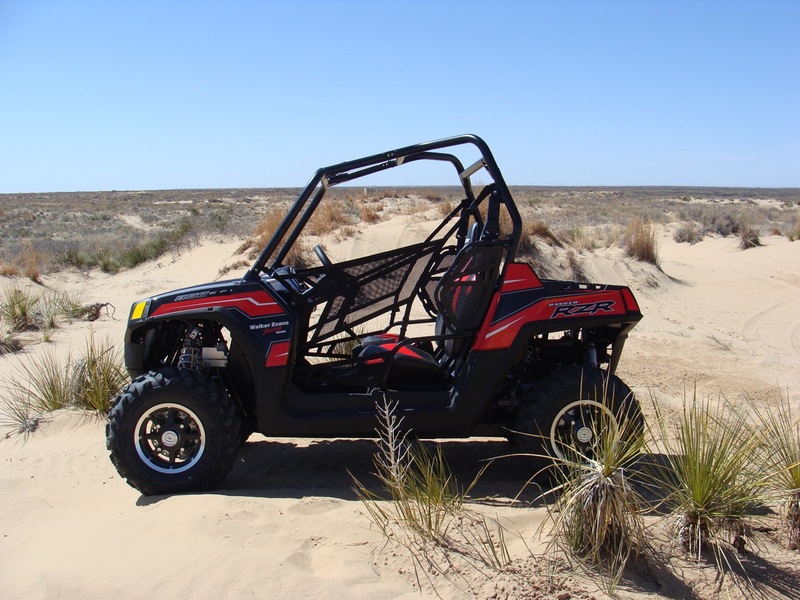 Okay, so we know that this RZR is set-up for trail riding, but we decided to take it out to the dunes and see if this Walker Evans LE is really a one-trick pony. First impressions when we got to the sands, wow 50 is narrow! 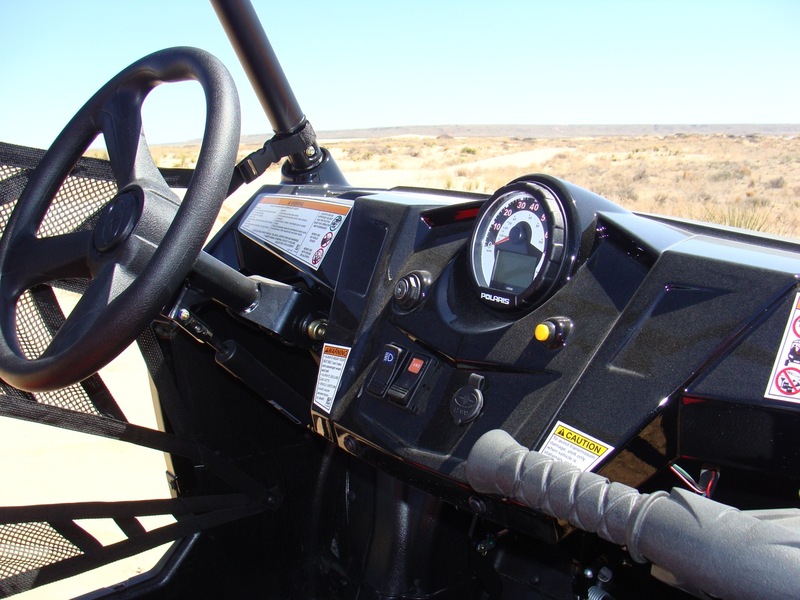 While the other UTV pilots that were with me were driving RZR-Ss they made this LE look like a true razor  thin and sharp. Shortly after we all started riding I found out where this slim RZR would come in handy. 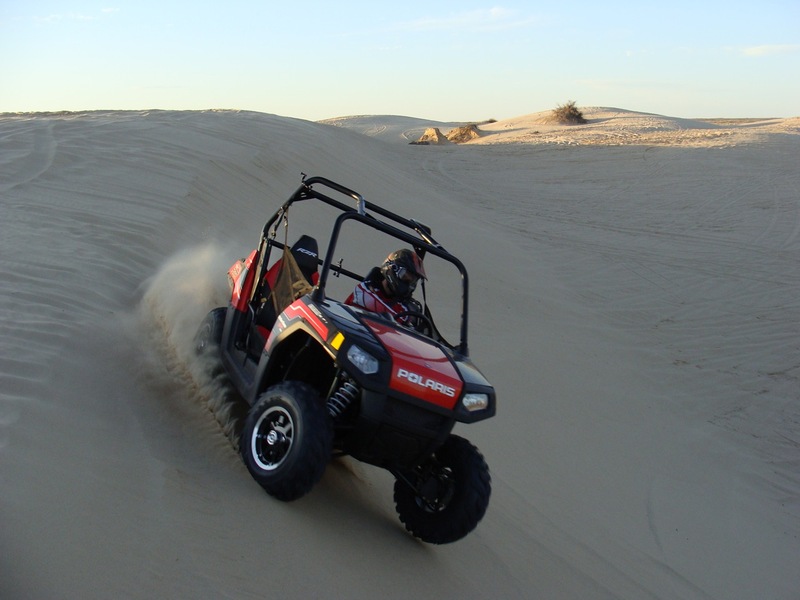 Our testing grounds is in the heart of the Southwest so our dunes also come with narrow sandy trails lined with mesquite bushes. While were doing our best to carve them out to the RZR-Ss porky 60 width, the slim Walker Evans LE just maneuvered effortlessly through the windy trails. Chalk one up for the LE! The Walker Evans LE was also very good in the flats. 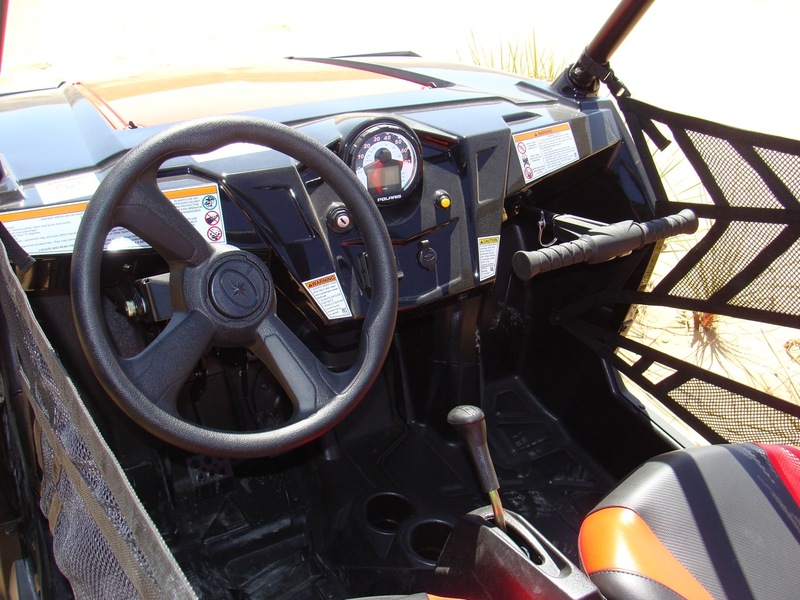 Even though the RZR-S comes with a H.O. version of the same 760cc, it has to spin those gnarly Maxxis Bighorns that come standard and push the added weight of the extra cage and longer suspension components. The LE wasnt as quick in 2WD on the sand because of the narrow stock tires, but switched into 4WD it was very quick and had a lot of punch. I could definitely run down the S  in the straights that is! 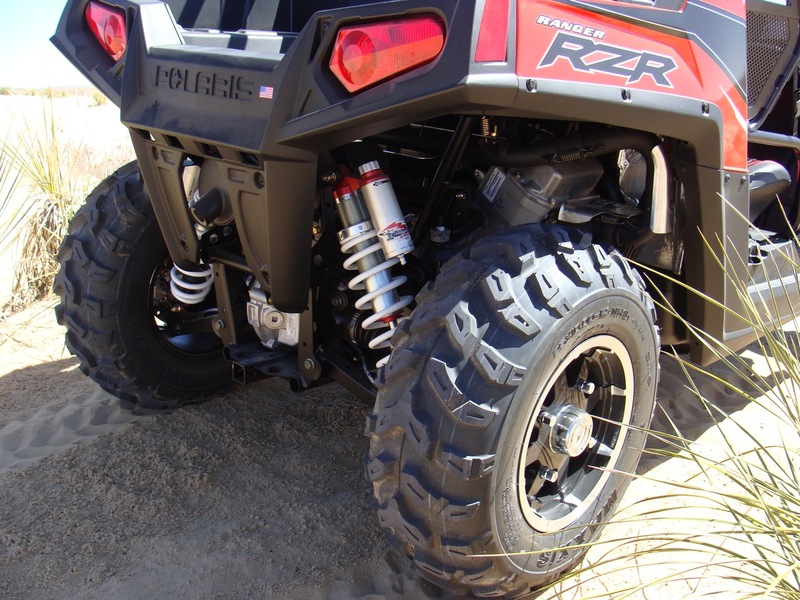 Keep in mind that this RZR is engineered for the trails and it is taller than it is wide. So, in wide open spaces it does well in a relatively straight line, but it doesnt give the confidence that the S model does when you flick the wheel from side to side. The factory settings on the Walker Evans Racing Shocks performed nicely right out of box. 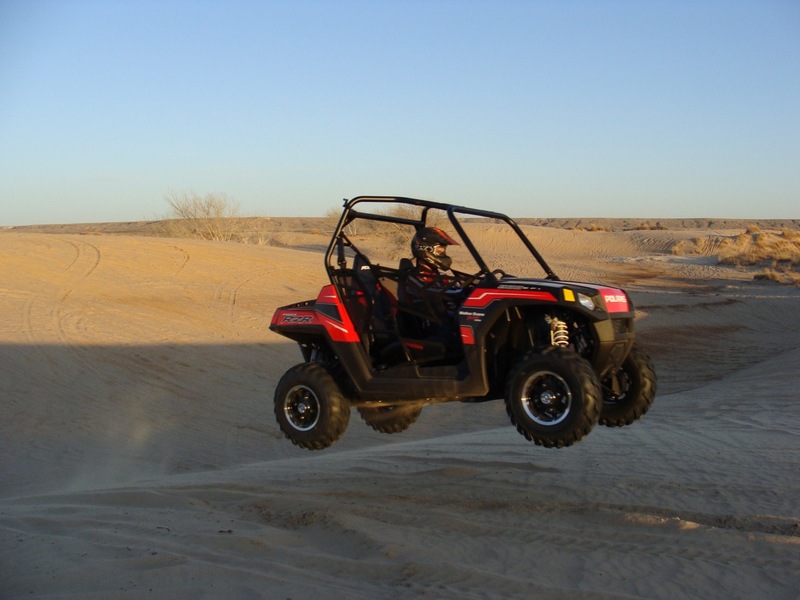 It glided over the desert terrain and rutted-up sand with ease at moderate speeds. Along with the narrow width does come some compromise though. For one this means less wheel travel. Thats 3 less than its bigger brother, RZR-S. This became apparent when hammering through the whoops. Although the LE did a lot better than expected, at high speeds it would start to buck and the back end seemed to wander. However, with a couple of quick clicks on the easily accessible compression knobs on the top of the Walker Evans Racing Shock reservoirs, the dialed-in LE RZR soaked up the whoops a lot more efficiently. Usually with factory equipped shocks and suspension it seems as though adjustments have little to no effect on the actual ride or behavior of the vehicle. 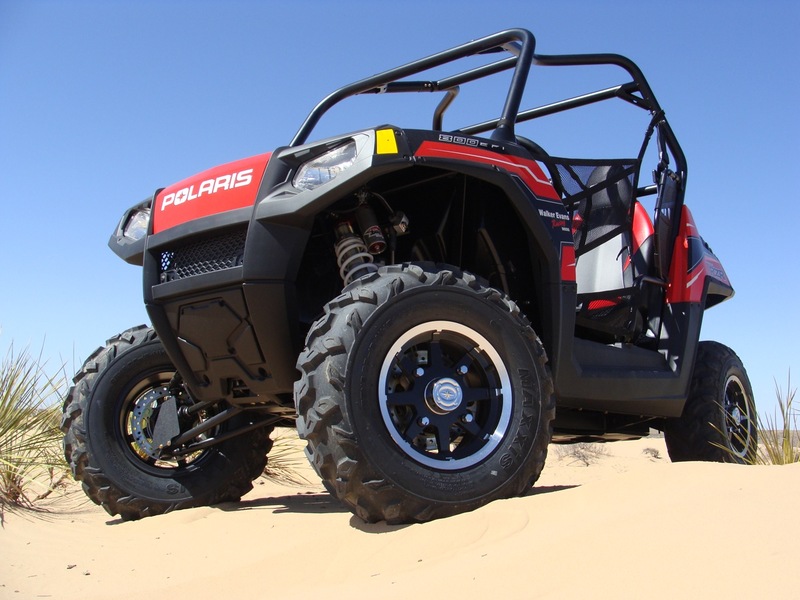 Well, the partnership between Walker Evans Racing and Polaris Industries has changed that! The quick, on-the-side-of-the-trail adjustments made a noticeable difference, not just through the whoops, but also across the uneven desert terrain and in the general ride quality itself. Sometimes when making small adjustments like this it seems as though there might be more of a placebo effect than a real improvement, but multiple riders confirmed that the ride was noticeably better after the adjustments were made. All and all the Walker Evans LE RZR was a blast to drive! Even though it was out of its element, it took on all the challenges that were thrown at it and it exceeded all expectations. 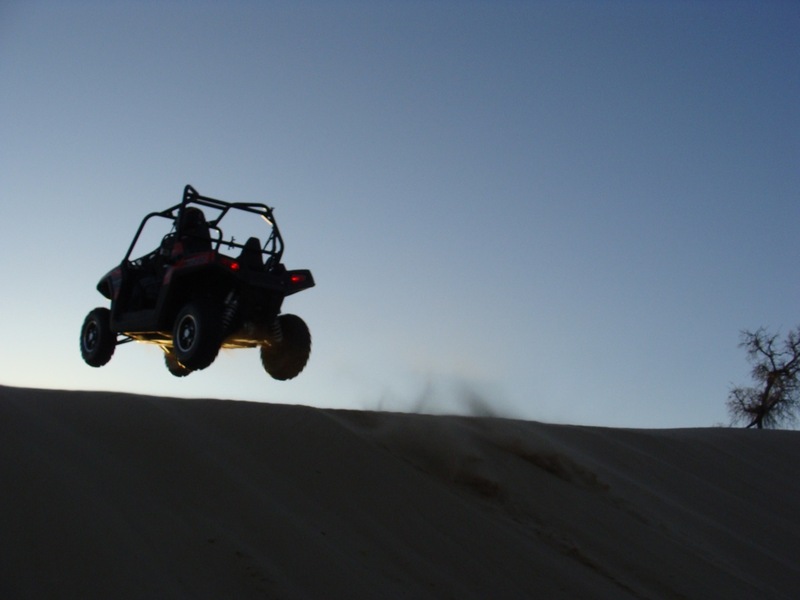 Its not the first choice if youre a sand or dune rider, but its definitely one of the top choices if you have a wide array of riding terrains at your disposal. 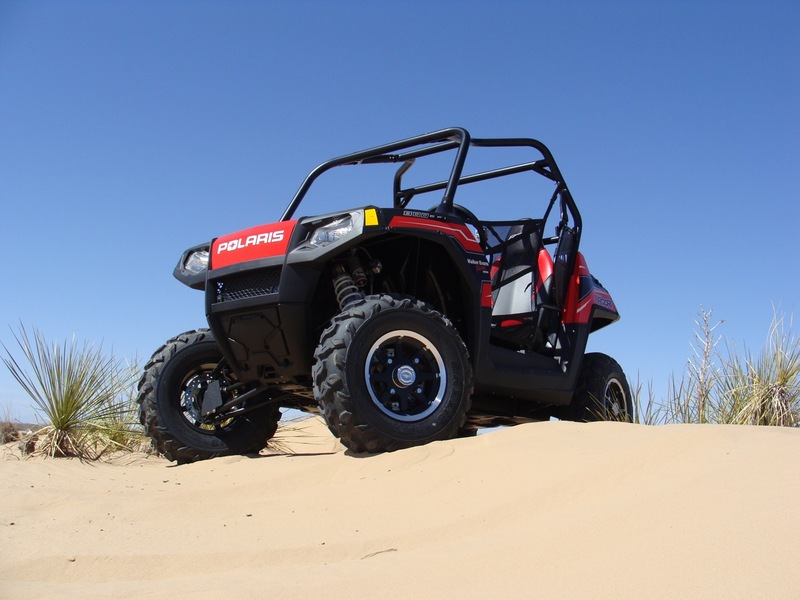 It also has all the amenities and features that you come to expect from a UTV wearing the Polaris badge and is just down right fun no matter where you are! Stay tuned for Part 2 of the review of this Limited Edition RZR where we take it to where it feels more at home, on the trails! 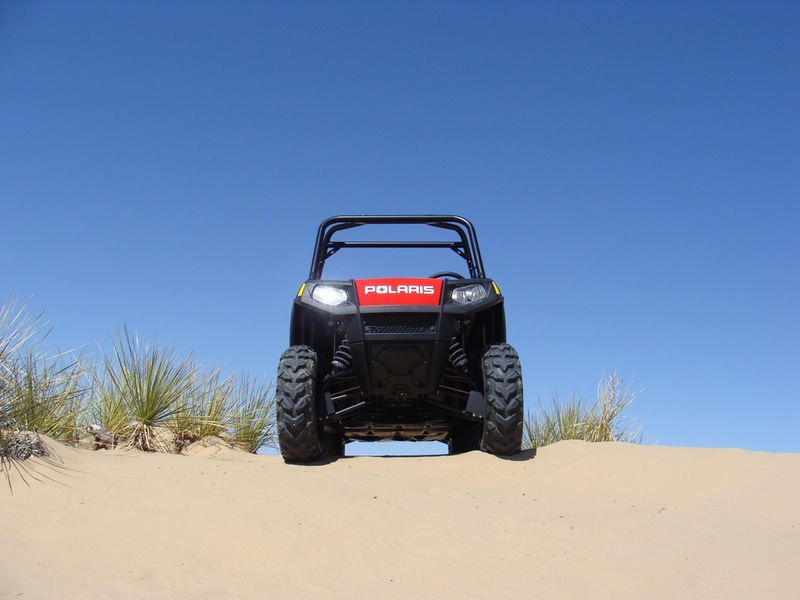 Find out more about its features, specifications, pricing, comparisons, reviews, accessories, videos, images, 360 views, custom brochures, downloads, and locate your nearest dealer that has the RANGER RZR® Walker Evans LE Side-By-Side Vehicle.